The Diet Dictocrats told us to drop butter decades ago and switch to a so-called healthier substitute called margarine made with what they claimed would be less harmful polyunsaturated fats. Their promise was it would prevent disease. People around the globe questioned this advice, especially those who have valued butter for its life-sustaining properties for millennia. Today we know that butter is light years healthier than margarine ever could be. It’s a lesson to never go against the wisdom of our ancestors and always distrust corporate and malicious propaganda designed to generate profits not health. It doesn’t take a Ph.D. in statistics to conclude that butter is not a cause. 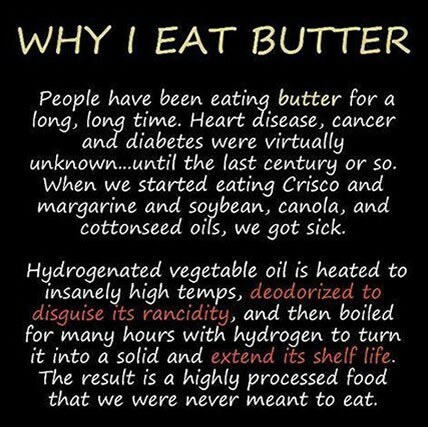 Actually butter contains many nutrients that protect us from heart disease. First among these is vitamin A which is needed for the health of the thyroid and adrenal glands, both of which play a role in maintaining the proper functioning of the heart and cardiovascular system. Abnormalities of the heart and larger blood vessels occur in babies born to vitamin A deficient mothers. Butter was and is still is recognized by many as the most easily absorbed source of vitamin A. Butter also contains a number of anti-oxidants that protect against the kind of free radical damage that weakens the arteries. Vitamin A and vitamin E found in butter both play a strong anti-oxidant role. Butter is a very rich source of selenium, a vital anti-oxidant–containing more per gram than herring or wheat germ. Butter is also a good dietary source cholesterol. What?? Cholesterol an anti-oxidant?? Yes indeed, cholesterol is a potent anti-oxidant that is flooded into the blood when we take in too many harmful free-radicals–usually from damaged and rancid fats in margarine and highly processed vegetable oils. A Medical Research Council survey showed that men eating butter ran half the risk of developing heart disease as those using margarine. 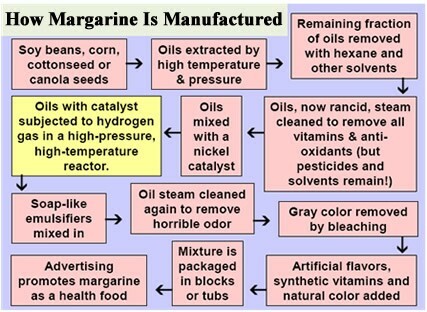 It’s not surprising when you see how margarine is actually manufactured. These days there are other con artists such as Earth’s Balance deceiving consumers and convincing perhaps millions of unsuspecting vegetarians and vegans into thinking they have the next best spread to replace butter when all they contain is genetically modified ingredients and more toxic oils like Canola. Mono- and di-glycerides: These contain trans fats that manufacturers do not have to list on the label. They are used in high amounts in so-called “low-trans” spreads. Soy protein isolate: This highly processed powder is added to “low-trans” spreads to give them body. It can contribute to thyroid dysfunction, digestive disorders and many other health problems. Besides containing toxins, non-organic butter also is less nutritious than organic butter… less creamy… and less tasty. Is there any reason to buy any butter that’s not organic? Well, organic butter is more expensive than conventional butter — but the difference in a household’s overall budget is truly small, especially now that national grocery chains, such as Whole Foods and Trader Joe’s, are offering their own organic store brands. In the 1940’s research indicated that increased fat intake caused cancer. The abandonment of butter accelerated; margarine–formerly a poor man’s food– was accepted by the well-to-do. But there was a small problem with the way this research was presented to the public. The popular press neglected to stress that fact that the “saturated” fats used in these experiments were not naturally saturated fats but partially hydrogenated or hardened fats–the kind found mostly in margarine but not in butter. Researchers stated–they may have even believed it–that there was no difference between naturally saturated fats in butter and artificially hardened fats in margarine and shortening. So butter was tarred with the black brush of the fabricated fats, and in such a way that the villains got passed off as heroes. Vitamin A and the anti-oxidants in butter–vitamin E, selenium and cholesterol–protect against cancer as well as heart disease. The Wulzen or “anti-stiffness” factor is a nutrient unique to butter. Dutch researcher Wulzen found that it protects against calcification of the joints–degenerative arthritis–as well as hardening of the arteries, cataracts and calcification of the pineal gland. Unfortunately this vital substance is destroyed during pasteurization. Calves fed pasteurized milk or skim milk develop joint stiffness and do not thrive. Their symptoms are reversed when raw butterfat is added to the diet. The notion that butter causes weight gain is a sad misconception. The short and medium chain fatty acids in butter are not stored in the adipose tissue, but are used for quick energy. Fat tissue in humans is composed mainly of longer chain fatty acids. These come from olive oil and polyunsaturated oils as well as from refined carbohydrates. Because butter is rich in nutrients, it confers a feeling of satisfaction when consumed. Can it be that consumption of margarine and other butter substitutes results in cravings and bingeing because these highly fabricated products don’t give the body what it needs?. Who benefits from the propaganda blitz against butter? The list is a long one and includes orthodox medicine, hospitals, the drug companies and food processors. But the chief beneficiary is the large corporate farm and the cartels that buy their products–chiefly cotton, corn and soy–America’s three main crops, which are usually grown as monocultures on large farms, requiring extensive use of artificial fertilizers and pesticides. All three–soy, cotton and corn–can be used to make both margarine and the new designer spreads. In order to make these products acceptable to the up-scale consumer, food processors and agribusiness see to it that they are promoted as health foods. We are fools to believe them. If your faith in the official health agencies that shape our nation’s health policies is not melting away faster than…well, butter off a hot knife, get your head out of the sand and look at their track record. Tagged buter, cholesterol, fat. Bookmark the permalink.